The first images acquired by a new UK-built, high-resolution, Earth-observation constellation have been publicly released. The three spacecraft are owned and operated by Surrey Satellite Technology Limited, which is based in Guildford. Rural, coastal and urban scenes from Argentina, Italy, and Greece are featured in the sample pictures. Surrey has leased all the time on the satellites to 21st Century Aerospace Technology Ltd of Beijing. 21AT refers to the trio as the TripleSat Constellation and will be using them primarily to survey Chinese territory. Their data will help with urban planning, working out crop yields, pollution monitoring and doing biodiversity assessments, among many other applications. The satellites see the Earth in a range of visible and infrared wavelengths. They fly as a train around the globe, with a separation between each platform of 33 minutes. And from their altitude of 651km, they can trace surface features down to one metre in a panchromatic mode (back and white), and four metres in a multispectral (colour) mode. The swath covered by an image is 24km. The spacecraft also have the ability to swivel and look sideways, and so will often be tasked to work in unison to patch together wide mosaics, or even make stereo views of particular scenes. 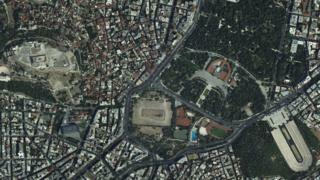 The rural shot of Argentina was acquired by TripleSat-1; the view of the Acropolis and Panathenaic Stadium in Athens, Greece, was captured by TripleSat-2, and the image of the Adriatic resort city of Rimini, Italy, was taken by TripleSat-3. Look closely and you can see the neat rows of parasols on the beach. Its decision to lease time on the satellites, as opposed to selling them or their data direct to 21AT, is a new way of working for the Guildford company. It just so happens that on this occasion, 100% of the time has been leased by the Beijing operator. However, Surrey has a fourth platform that is almost built that could be leased to other users for periods of time. SSTL's founder and executive chairman, Sir Martin Sweeting, said he hoped potential customers would be impressed by the capability demonstrated in the new pictures. "The DMC3/TripleSat constellation comprises the world's highest capability-for-cost Earth observation satellites in their class, and confirms SSTL once again at the forefront of small satellite missions and innovative business models," he told BBC News. Sir Martin was speaking here in Paris at the World Satellite Business Week conference organised by Euroconsult. The DMC3/TripleSat satellites were launched in July by a PSLV-XL rocket from the Satish Dhawan Space Centre in India.